Twelve year old Moth lives in a tenement slum with her mother, a gypsy and fortune teller by trade. Though she longs to be the apple of her mother’s eye and often imagines a life of ease and refinery, the truth is that Moth’s mother is ambivalent about her child and her welfare. Left by a careless man who only wanted her maidenhood, Moth’s mother is an emotionally and physically absent parent. While Moth is busily running the streets in rags and fending off the boys, her mother is quietly selling off everything of value to pay her many demanding creditors. One night, Moth is awakened by her mother to discover that she is to be sold off as well. Moth is taken in as a lady’s maid in the home of the abusive Mrs. Wentworth, a woman who at first seemed innocuous but soon grows peevish and destructive. But Moth is a survivor, and she escapes this hellish situation to be met by a beautiful young girl who promises her a better life. This grand new life she stumbles upon comes from the hand of Miss Everet, a woman who is in the business of selling virgins to the highest bidder. As Moth comes to know the world of luxury, she never forgets that one day she will be giving up her most prized possession, squirming fruitlessly under a man who has paid for her flesh. But an unlikely friend appears in the guise of a female doctor, who is committed to care for the girls in the house both before and after their virginity is taken. Will Moth escape this life of genteel brutality for the life of her dreams? Or will she find herself left used and ruined by a man under the spell of Miss Everet and her house full of beautiful human merchandise? In this artful blend of history and fiction, Ami McKay brings us a tale of fear and seduction, obscene wealth and crippling poverty, and a girl named Moth at the center of it all. When I first heard that Ami McKay had a new book coming out, I was alight with feverish excitement. But I soon found out that the book was only released in Canada, and to later make its debut in the US. When I was approached to review this book for TLC Book Tours, I didn’t give it a second thought. I knew I must read this one right away. And for all you lovers of intriguing historical fiction, I can honestly say that this book had me wrapped in its spell from the very first page until its final climactic ending. Moth is only twelve but is savvy and smart in the ways only a street urchin can be. While she dreams of the finer things, she has little hope of ever seeing them. Living in a world where her body must be protected at all costs has made her not only cautious, but wily. She knows how to beg, borrow and steal, while always grasping at the wisps of dreams that float through her hands. I found Moth to be an incredibly endearing character, and one who not only had morals, but scruples as well. She was bright, and never lived a life of bartering her body like the other girls in her station had done.Though her dreams were bigger than her prospects, she tried to maintain the upper hand through using her wits rather than selling both her body and soul. When Moth is placed as a lady’s maid in Mrs. Wentworth’s home, life takes on a new hue of happiness for her. She is well dressed and regularly fed, and though she tries to make a new start for herself, Mrs. Wentworth is an exacting and cruel employer whose brain is addled and strained. Though she claims to want the best for the girl, it’s obvious that she wants to break and demoralize Moth. The women are locked in a struggle that will never end and grows more dangerous every day. One close call too many, and the struggling Moth flees with no thought of where she will land, leaving her in a very dangerous city, struggling alone. When Moth’s new friend inveigles a place for her at Miss Everett’s, all her dreams seem to come true. She has the finest of everything and longs for nothing. But the price is steep, for Moth is being trained to become a prostitute, and her virginity is highly prized by the men she must consort with. I found this situation unbearably distressing, and the fact that she was only twelve made matters all the worse. Moth plays at being a grown-up, but she’s still a child, dressed and paraded about as a strumpet. It’s harrowing to know that her day is coming and a suitor has been chosen to buy her. Her only hope is Dr. Sadie, a woman who is kind and good and virtuous. But this woman can’t give Moth the life she desires, and the young girl is trapped between two worlds, forcing her in different directions. The broken Moth will be rich and sought after, but the intact Moth could have a chance at happiness. If you’ve been debating whether or not you should read this book, I would say “go for it” with gusto. The book does a great job of highlighting the seamy underbelly of New York during a time when the poor must do anything to survive and the rich turn their heads away. Moth’s story is not only compelling, but speaks to the heart of every woman throughout time who has ever wondered what they were worth, and if it was enough to make a life out of. A more transporting read would be hard to find. Highly recommended. 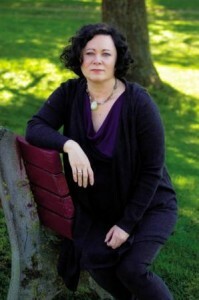 Ami McKay is the author of the #1 Canadian bestseller The Birth House, the winner of three Canadian Booksellers Association (CBA) Libris Awards and a nominee for the International IMPAC Dublin Literary Award. Her work has aired on various Canadian radio programs, and her documentary, Daughter of Family G, won an Excellence in Journalism Medallion at the 2003 Atlantic Journalism Awards. She is also active with UNICEF and other organizations. Originally from Indiana, she now lives with her husband and two sons in Scots Bay, Nova Scotia. Wednesday, July 4th: Book Him Danno! I can't wait to read this one!! The Virgin Cure sounds like the perfect next read after The Gods of Gothem!! Haven't heard a bad word yet! Such an intriguing premise and a must read by all accounts. Fantastic review! Oh I like the sound of this! Yes, goes well with Gods of Gotham and with Island of Vice. Wow, this sounds fascinating! I'm so curious what happens to Moth and if she gets out of it or not!!! This book sounds heartbreaking to me. I don't read much historical fiction but this sounds like one I might like. I need to read this one. I have it, but haven't managed to crack it open yet. I really loved this one. It's very different from The Birth House. I loved this one too! It was distressing, but it was so, so good. And even better news: Ami McKay told me on Twitter she's working on a sequel to this one! I can't wait! I'm not a historical fiction reader, but this like a great read for those who enjoy this genre. I'm not sure I can read this one. I had a really difficult time with The Blue Notebook (prostitution in India. The girl in that one was 9!) Reading it made me want to hack off male body parts. Not a good feeling. This does sound excellent, and, as usual, you've done a terrific job with your review! I need to read this one soon! Great review. Moth sounds like such an amazing character - I can't wait to get to know her! I have read a few historical fiction and so will likely add this to my wish list. Ohhh I was wondering why it didn't come out all of a sudden after I had heard about it. Well, I'm super excited to read this!! Oh I'll get back to your e-mail soon! I love historical fiction and this one caught my eye the first time I heard about it. I am so glad you liked it, Heather! I love your reviews -- you summarize the story so well and get to the heart of the themes and arcs. You have me wanting to reread this one already -- I was nodding my head and sighing as I read your review -- A more transporting read would be hard to find. -- my thoughts exactly. Brava, friend -- awesome review. Knowing an 11-year-old girl helps me put this in perspective … I can't imagine. It sounds like historical fiction with an edge. Is her name really Moth or is that a nickname given to her? It seems like such an unusual name for a girl of that (and any) era - symbolization of a delicate thing being drawn to something dangerous! After about a year of debating, I finally released this one on my hold list at the library, only to find your ever-so-encouraging review here now, so I'll take that as a bookish sign that the timing is finally right: I'm really looking forward to it! I was with you - when I saw this one show up on TLC, I jumped at the chance to read and review it. McKay's really set the bar high for herself with two great books now.